JAMAICA, N.Y. -- Police have identified a woman who was found incoherent on a Queens street. 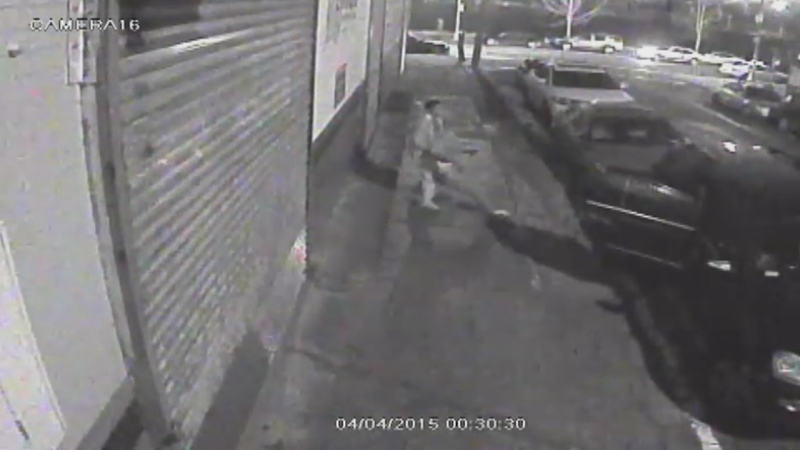 Police are hoping this surveillance video will lead to an arrest. The young woman has been in Jamaica Hospital since she was taken there early Saturday morning. But on Tuesday, police used a surveillance video to help them figure out who she is. Safiya McLean, 18, is believed to be homeless. She remains in critical but stable condition at Jamaica Hospital. The video shows the man, who police later announced knows the woman, in a dark-colored SUV, pulling into a parking space along 131st near Jamaica Avenue just before 12:30 a.m. He then walks around the corner before returning to the vehicle and opening the passenger side door. He drags McLean's slumped-over body onto the sidewalk and props her up against the side of the building, then hops back in the SUV and drives off. For nearly 20 minutes, she is alone until police and medics arrive. According to the New York City Police Department, the man on the video knows her, saw her walking on the street and went to help her. She was unable to take care of herself, so he put her on the sidewalk and got help. Detectives said she was not abandoned, and the man told them he was present when EMS took her to the hospital. According to the New York City Police Department, she was not unconscious at the time, but was communicating with him. She has a compromised mental state. The man is being treated as a Good Samaritan, no charges are being filed at this time, and the investigation continues. She is now on a ventilator. Police said she is being treated for double pneumonia and sepsis, a severe blood infection.